The annual mid-year Tournament in Singapore came with an ‘improvement’ this year, staging the Asian Cup 2016 and a bigger National Championships, together with it being the very 1st FISTF Grand Prix Tournament for Singapore. 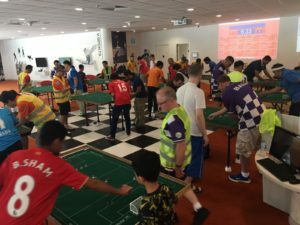 The Singapore GP continued the growth of the game in Asia, with 37 players in the Open event, 2 more than the Sydney GP in January. More importantly, there were players from Singapore, Australia, Malaysia, and Japan, as well as from Austria, Belgium, France and England. As always, the U19 competition featured 10 young local players fighting it out again in a Swiss format competition. This competition have always seen new comers into the game and its no difference for this year. It was a close finish at the end with the usual promising youngsters of Giovanni Choong, Isaac Lim and Bhavin Sham topping the table with small difference between them. As close as it is, Giovanni proved that he is still the one to beat as he edges out Isaac Lim to the winners podium by 2 points. 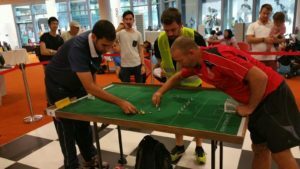 With the U19 winners decided, the National Players from both Singapore and Australia took to the tables, to decide the Asian Team Challenge Championship. Defending a close win over the Australia National Team in the first Asian Challenge in Melbourne back in 2015, the Singapore Team took the challenge again with a slightly different line up, as did Australia. Once again, it was an extreme close fight between both the National Teams playing out to a 2-2 draw, with Singapore taking the win only with a superior goal difference, and defending their title of Asian Team Champions. 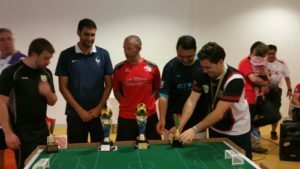 Thereafter, a total of 9 teams — with two special teams making up of a European selection and an Asian selection – took part in the Asian Club Championships. With reigning champions Northern Falcons TFC (AUS), SG Lions SC and Jurong Central SC (SIN), a tough competition was set. The special teams were not to advance beyond the 1st stage, by virtue of the format of the competition, it was the Jurong Central SC ‘A’ Team proving the best of the lot, to take the Club Team Champions trophy. On the 2nd Day of competition, it was time for the individuals to play for their personal glory in the OPEN Category. In the group phase there were some surprises and heartbreak. Australia’s Jonny Ball drew the true “group of death”, lining up with Christian Haas (AUT) and Kaspar Bennett (ENG). In his match against Kaspar, he attempted to “park the bus” but was ultimately doomed to a 4-0 loss. In the last 16, Christian Haas started to assert his authority with a 9-0 demolition of John Ho, while Den Mulia could not repeat his heroics of last year and fell 0-3 to Ouabi. 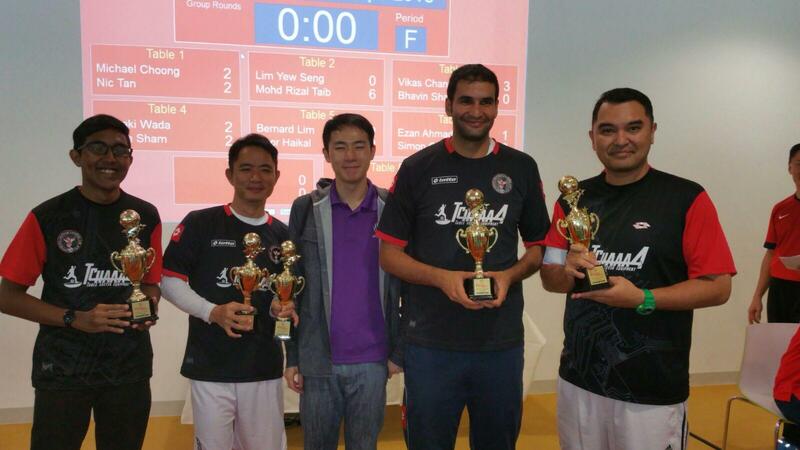 Ruelle caned Chandru Chugani, one of the ‘godfathers’ of Singapore table football, 12-1, while Bernard Lim eclipsed Sham Doulatram 3-2 in a nailbiter. In the quarters, Peter Thomas admitted he had “nothing in the tank” as he fell 1-0 to Ouabi, while David Ruelle outgunned Kaspar 3-1 and Rudy Hesty became the only Asian player to make the semis with a 3-1 win over Bernard. Ouabi caused something of an upset by beating top see Christian 1-0, while Rudy had no answer to the raw power of David in a 7-0 masterclass in the semi-finals. From the beaches of Koh Samui to the tables of Singapore, Belgium’s David Ruelle staged an amazing comeback to the game to claim this inaugural Singapore Grand Prix. In a tense and highly contested final, be beat Singapore resident Ouabi Rouis of France 1-0, after storming his way through the groups and knock out phase. 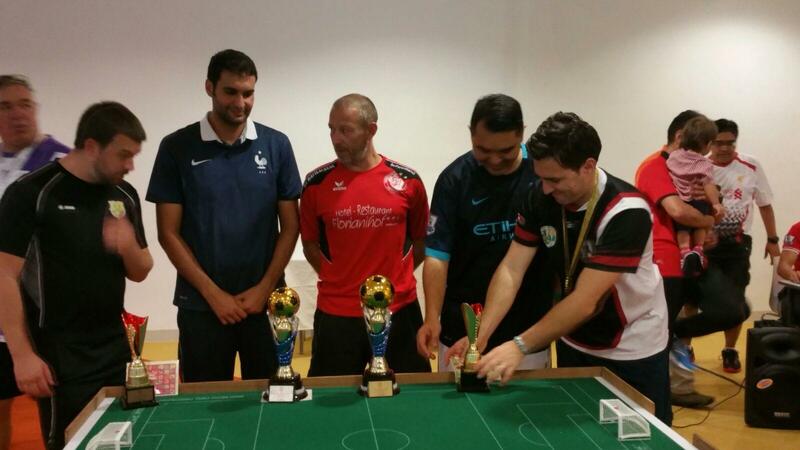 In the plate event, Raffaele Lombard of Subbuteo Parramatta beat fellow Australian Steve Dettre (Northern Falcons) 2-0 in the final. This also made the 2nd successive Plate Win for Raffaele on Singapore shores. After 2 days of intense Table Football Action, we must say that it was one of the most highly contested Tournament TFAS has ever staged. Till the next Asian Challenge in 2017, to be held in Japan, we look forward to meeting everyone again!